RUGGED & RIGID TREAD BLOCKS feature support ramps and step‐down features that provide tread-pattern rigidity in the contact patch enhancing vehicle stability and handling, while also preventing stones from becoming trapped in the grooves. 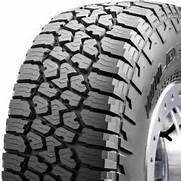 SILICA TREAD COMPOUND delivers superior wear life and wet performance. 2 non‐LT sizes.